After almost 5 weeks hanging out with friends in Europe (see previous post), it was time to get back on the trail. So after a 12-hour flight from Paris, I landed in Kathmandu, Nepal, home of the Himalaya Mountains and Mt Everest, the highest peak in the world. So how did I spend almost 7 weeks in Nepal? Exploring and trekking, of course! Being my first time in Asia, I had a bit of culture shock upon arriving to the capital city of Kathmandu (population 975,453) with its unfamiliar language and customs. However, given the friendly nature of the Nepali people with their respectful greeting of “namaste” and the prevalence of English-speaking locals and travelers, I quickly adjusted. I arrived on Day 3 of Tihar, a 5-day festival that, per Wikipedia, “shows reverence to humans, the Gods, and the animals, like crows, cows and dogs, who maintain an intense relationship with humans. People make patterns called Rangoli on the floor of living rooms or courtyards using materials such as colored rice, dry flour, colored sand or flower petals outside of their house, meant to be a sacred welcoming area for the Gods and Goddesses of Hinduism.” On this particular day, kids walked shop to shop singing traditional Bhailo songs, receiving small amounts of money and candy from shop owners in return. The explosion of festive colors and sounds was a great introduction to Nepal. 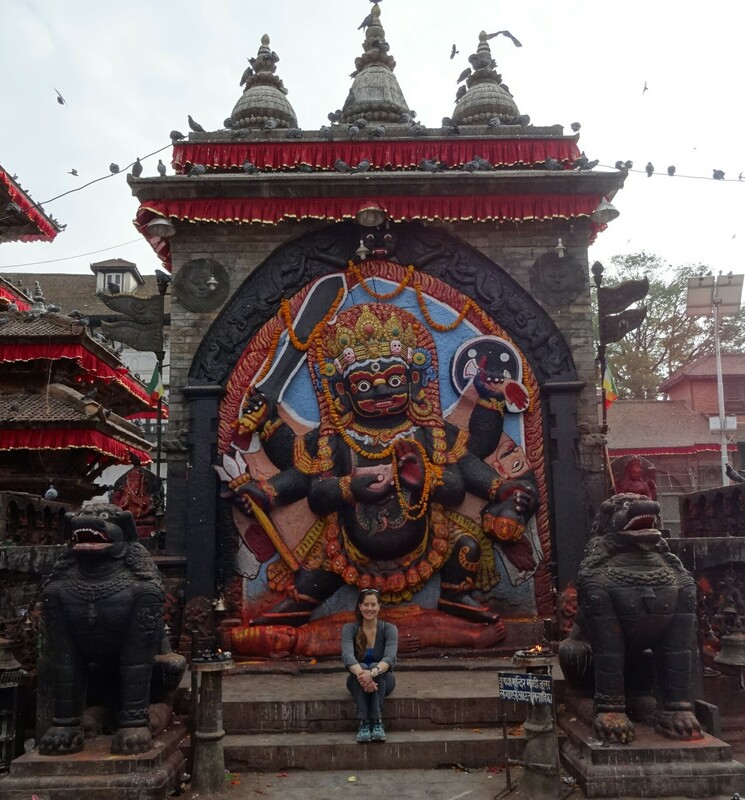 While in Kathmandu, I hung out with my friend, Corey, from San Diego, and explored the city, including Durbar Square, the Monkey Temple, and Thamel, the area where most travelers stay. I even went dancing at some local clubs with friends I met at my hostel. It was a fun night of shaking my booty to a mix of American and Nepali hip hop. While exploring the city, I passed homes and businesses whose walls were being supported by wooden beams, large mounds of bricks, and large excavated pits interspersed among intact structures. Given the seemingly unregulated building practices in Kathmandu, it was difficult to determine if this was status quo or earthquake damage. However, locals confirmed that it was primarily damage from the 7.8-magnitude earthquake that occurred in April 2015. The earthquake had also severely damaged many of the temples of Durbar Square. It’s unfortunate that I only saw the temples post-earthquake as I could only imagine their previous significance and beauty. While the damage was still very evident around the city, rebuilding was underway. When I asked about the effects of the earthquake, the handful of Nepalis I talked to preferred to talk, with pride, about how they were rebuilding instead of about their losses. Along with being friendly, they are proud, resilient people. After four days in Kathmandu, Corey and I, our backpacks filled with warm clothes, sleeping bags, miscellaneous items, and too many snacks, took a 9-hour bus to the small town of Bhulbhule (2,755 ft, 840 m) to start the trek. 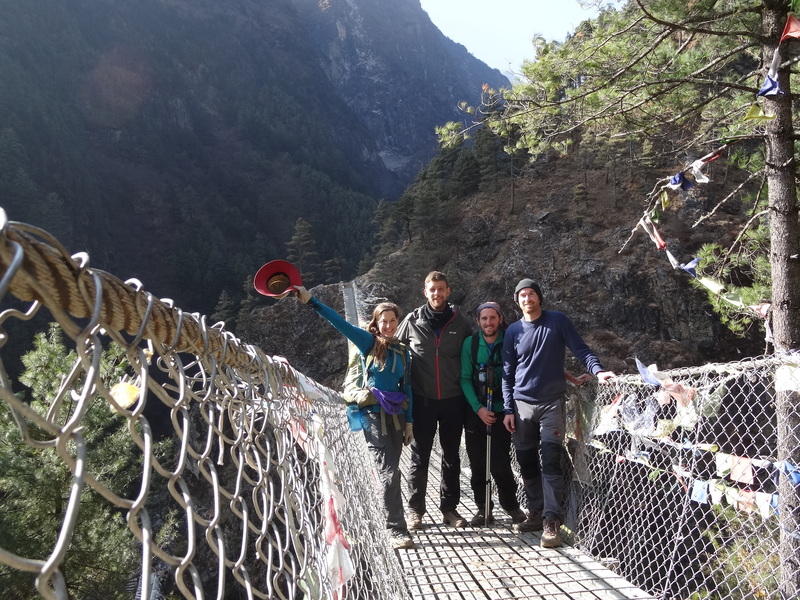 The Annapurna Circuit-Base Camp trek is within the Annapurna Conservation Area, Nepal’s largest protected area. Per Wikipedia, the Circuit ” crosses two different river valleys and encircles nine mountains, four of which are above 26,000 ft (7925 m) and has often been voted as the best long distance trek in the world, as it crosses a wide variety of climate zones from tropics to arctic at Thorong La pass and has cultural variety from Hindu villages at the low foothills to the Tibetan culture of the high altitude valleys and mountains.” The trail went through jungle, rhododendron and pine forests, arctic scrub, and passed terraced rice fields, waterfalls, gigantic cliffs, and countess colourful Buddhist prayer flags and wheels, mani walls (piles of stone tablets engraved with Buddhist prayers), stupas (Buddhist shrines), and several beautiful gompas (monasteries). The trail also crossed numerous bridges, of which 28 were suspension bridges (I kept count), giving the feeling of being in an Indiana Jones movie. During the trek, we passed through numerous small villages, adding to the experience by offering a peak into the daily life in these rural communities and allowing some interaction with the friendly locals. We slept each night in a village. While the lodges were typically simple, they provided a bed with warm blankets, toilets, and a shower, occasionally with hot water, and I enjoyed the luxury of a private room each night. Since the lodges were very cheap ($1-2 per night) or sometimes free, the owners expected trekkers to eat dinner and breakfast at their lodge ($2-6 per meal). The food was typically tasty but since the menu was almost identical at every lodge along the entire trek, I became less excited about my meals as time passed, especially dinner, which was typically dal bhat (a plate of rice with veggies and soupy lentils), veggie curry, or fried rice, noodle, or potato with veggies and cheese or egg. There were a few other choices on the menu (i.e., pizza, burgers, spaghetti) but I chose to eat only Nepali dishes for dinner. On a few occasions, I sampled the Nepali booze: raksi (a traditional home-brewed alcohol of millet or rice), chhaang (a fermented “beer” of barley, millet, or rice), and apple brandy. Apparently, raksi was ranked 41st on CNN’s list of the World’s 50 most delicious drinks (water was ranked 1st and mango lasse (a creamy fruit shake) was ranked 50th). These drinks tasted…interesting and they were cheap and warmed the body. 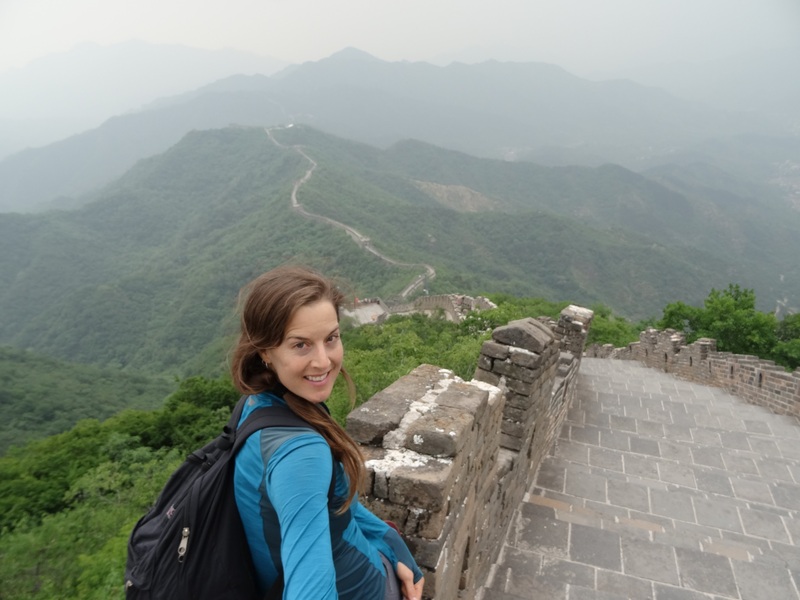 While many people hire a porter and guide for the trek, Corey and I carried our backpacks and found our own way, following a map, a guide book, and the red and white markers of the “alternative trail” painted on rocks, trees, and posts. Following the alternative trail allowed us to avoid hiking on the relatively new jeep road that parallels portions of the Circuit. For the first two days, we trekked along a river valley then finally saw the mountains. While the jungle and forests were absolutely beautiful, I couldn’t help but gasp when I got my first glimpse of the snow-covered peaks. Over the next several days, we continued along the valley, getting closer and closer to the high peaks. I never got tired of admiring the view each day. During a 2-night stop in Manang, the usual stopping point for trekkers to acclimatize before going over the high-altitude pass, I did an overnight trip to Tilicho Base Camp (13,615 ft, 4150 m) and Tilicho Lake, a glacial lake that at 16,237 ft (4949 m) is reputed among the Nepalis to be the highest lake in the world. The views of the mountains and glaciers around base camp and the lake were stunning. I couldn’t see the avalanches occurring on the slopes around the lake but it was very cool to hear them. On day 10 of the trek, Corey and I hiked up and over the pass, Thorong La, the highest point on the Circuit at 17,769 ft (5416 m). The trek up wasn’t long but much of it was steep and at that altitude, the air contained roughly 50% less oxygen than at sea level, making it noticeably harder to breathe. But the view from the top on that clear, sunny morning of the surrounding mountain peaks and the valley below was magnificent. To my astonishment, except for the tea shop guy, I was alone at the prayer flag-strewn pass for about 45 minutes until the other trekkers arrived, so was able to immerse myself in the view and the feeling of being at the highest point I’d ever stood (so far). A few days after going over Thorong La, Corey flew back to Kathmandu and I continued the trek solo. We’d had a great time trekking together for 13 days! On the descent, the trail again passed through forest and jungle along a beautiful river valley. I spent a night in Tatopani to enjoy the hot springs (and temporarily thaw my chilled bones) and two nights in Ghorepani to view the light of the rising sun on about 15 snow covered peaks from Poonhill, and to enjoy a rest day (my first after 16 days of trekking). 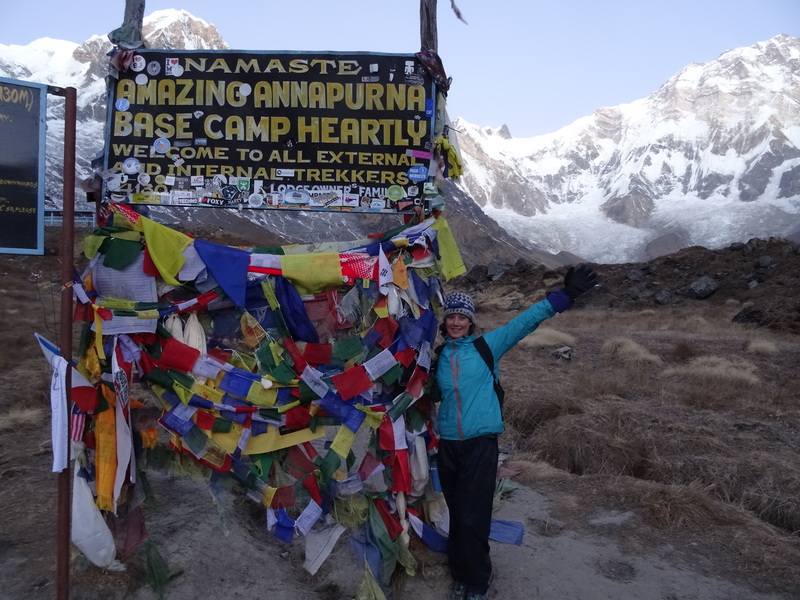 After, I started the trek up the valley to Annapurna Base Camp. Along the way, I met Herve (France) whom I hiked with for the remainder of the trek. I was especially happy to have a hiking partner for the very cold, predawn trek to Base Camp (13,550 ft, 4130m) where I viewed the light of the rising sun on the Annapurnas, this time from the opposite side as I’d seen from the Circuit. Beautiful! After enjoying the amazing view, we trekked down the valley, overnighted in Jhinudanda to enjoy the hot springs (and temporarily thaw our chilled bones), then on to Nayapul (3,510 ft, 1070 m), the end of the trek. From there, we took a 2-hour bus on a very windy road to Pokhara, a small lake-side town where many trekkers relax, eat, and celebrate after finishing an amazing trek. After roughly 175 mi (283 km) of trekking, it felt great to be warm, take multiple hot showers, relax, drink beer, and eat delicious food (that did NOT include dal bhat, curry, or fried noodles, rice, or potatoes!). After two days in Pokhara and four days in Kathmandu, during which I hung out with Corey, her friend, Ele, and Ele’s adorable son, I took a 10-hour bus to the small town of Shivalaya to start my next trek. Similar to my previous trek, the Everest Base Camp-Two Passes trail passed through varying landscapes which changed from terraced rice fields, jungle, and rhododendron and pine forest to artic scrub on the ascent up the valley to the high-altitude pass then changed back to forest and jungle on the descent into another valley. The majority of the trek is within the Sagarmatha National Park, a UNESCO World Heritage Site, and home to three of the tallest ten peaks in the world: Everest (29,028 ft, 8848 m), Lhotse (27,939 ft, 8516 m), and Cho Oyu (26,906 ft, 8201 m). This area is also home to the Sherpa people who “came to the previously uninhabited region about 450 years ago from Tibet to escape war, persecution, or famine and conducted subsistence agriculture and trans-Himalayan salt trading. It has been speculated that a part of the Sherpas’ climbing ability is the result of a generic adaptation to living at high altitudes.” Hence their success climbing Everest! During the trek, I again encountered numerous colourful Buddhist prayer flags and wheels, mani walls, stupas, several beautiful monasteries, crossed many suspension bridges (I counted 14), and stayed at lodges where I ate a lot of dal bhat. To start the trek, most people take a 45 minute flight from Kathmandu to Lukla. As there are no roads to (or in) the National Park, the only other option is to trek there. I opted to trek there starting from Shivalaya, adding about 38 mi (60 km). Although the distance is relatively short, the trail crosses three valleys, going over four passes, and added 5 days to my overall trek. Thankfully, I met Paul (UK), Guillaume (France), and Alex (US) on the bus to Shivalaya and trekked with them because I encountered only a handful of other trekkers during the first 5 days. We trekked through jungle and forest as we went up and down each valley. Then after a few days, we rounded a corner and had our first view of Everest. It was far away but it was cool to finally get a glimpse of the world’s highest peak. Along the way, we passed through many small villages, where friendly locals were going about their daily chores. Unlike my previous trek, there were signs of earthquake damage along the trail. Many of the buildings in the villages we passed through during the first several days had been extensively damaged or reduced to piles of rubble. While people were in the process of rebuilding, the effort will likely be a longterm process, especially since everything has be to carried by animal or human to these roadless areas. After 5 days of trekking, we arrived in Namche Bazar (11,286 ft, 3440 m) where I enjoyed a night of wifi and a last night of hanging out with the guys before saying farewell to them and starting the trek up the valley to Everest Base Camp. I spent the next 7 days above 13,800 ft (4200 m), during which I spent 3 very cold nights above 17,000 ft (5182 m). As I climbed higher in elevation, the view of the high peaks became more spectacular. 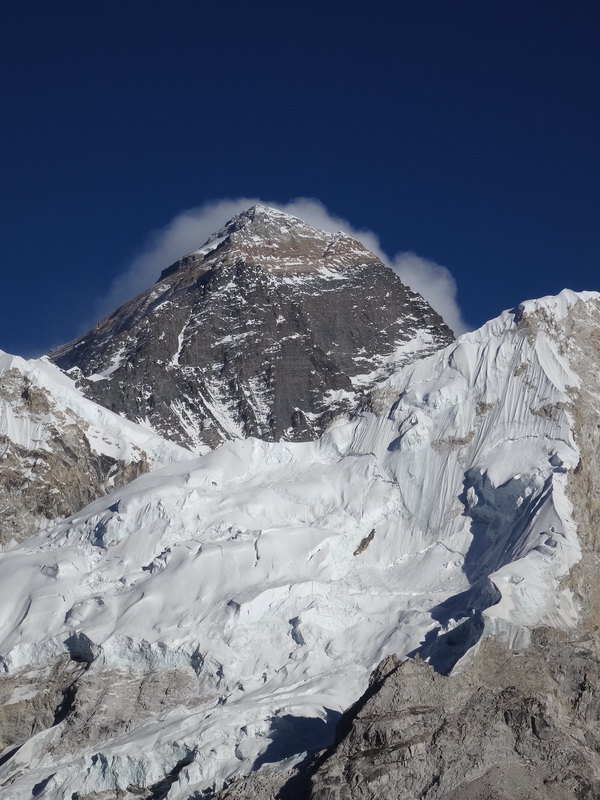 In Gorek Shep (16,863 ft, 5140 m), I had an amazingly close view of Everest and many other high peaks, including Lhotse. I planned to hike the 2 hours from Gorek Shep to Everest Base Camp (17,595 ft, 5363 m) but unfortunately woke up that morning with mild altitude sickness. Instead, I hiked to a somewhat lower elevation to acclimatize more before hiking over the first high-altitude pass of the trek. Thankfully I met Thomas (US) the night before I planned to cross Cho La, an icy pass at 17,782 ft (5420 m) that would have been foolish to do alone. We ended up hiking together for the remainder of the trek including hiking to Gokyo and over the second high-altitude pass. The views from Gorek Shep were amazing but the views in/around Gokyo (15,715 ft, 4790 m), located next to a glacial lake, were even more amazing. While there, Thomas, Zhenya (Ukraine), who’d we’d met at the lodge, and I hiked along the massive glacier to several beautiful frozen glacial lakes, enjoying more spectacular views of Everest and the surrounding peaks along with way. After two very cold nights in Gokyo, we crossed the second high-altitude pass, Renjo La. The trek up to the 17,585-ft (5360-m) pass was steep and long but worth the effort. 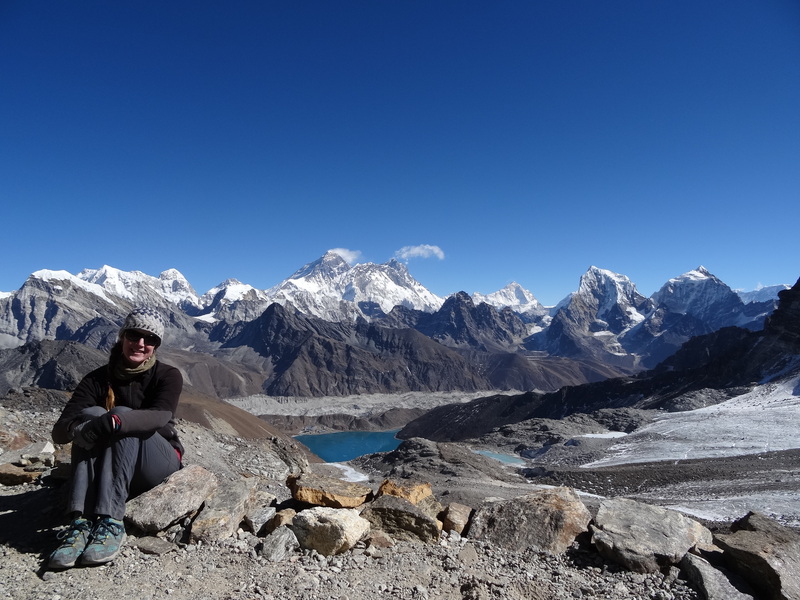 The views from Gorek Shep and Gokyo were amazing but the views from Renjo La were even more amazing! On that clear, sunny morning, we sat at Renjo La and enjoyed the stunning view of Gokyo Lake and the majestic mountains (including Everest) on one side of the pass and the view of the expansive valley and distant high peaks on the other side. From the pass, we started the 2-day trek down the river valley to return to Namche. During the trek, I considered hiking for another 4 days to Salleri to then take a 12-hour bus or jeep to return to Kathmandu. However, by the time I reached Namche, I was finally tired of trekking and tired of being cold, very cold. So, I hiked to Lukla to fly back to Kathmandu. 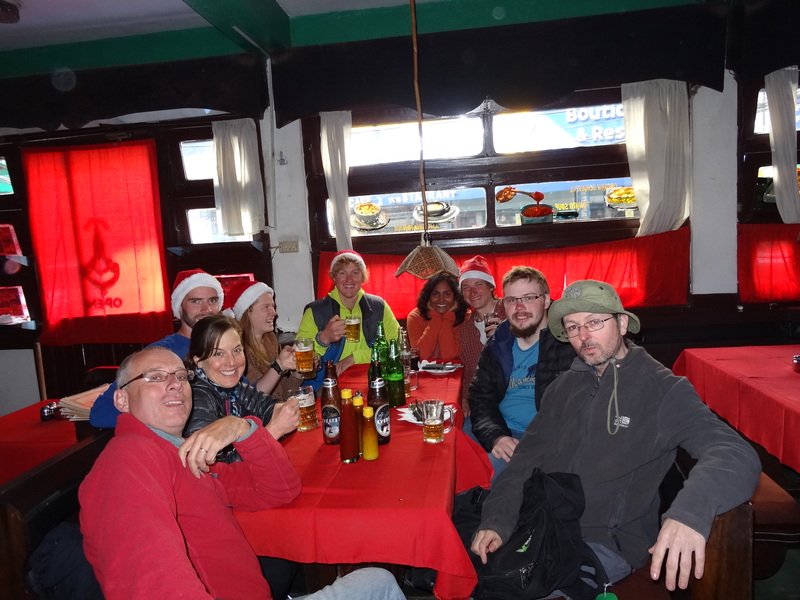 In Lukla, Thomas, Filip (Czech Republic), who we’d met in Gokyo, and I met Nathan, Raj and Ben (all from the UK). Thanks to Ben, we were introduced to tongba, “a turbid liquor obtained by leaching out the extract with water from the fermented mash of millet.” It was…interesting, especially since the mash of millet was served in a giant mug with a metal straw and was refilled several times with hot water. And it was free, warmed the body, and was a bonding experience among those of us who tried it. Ha! The next morning, we all walked the short distance to the airport which consisted of one building, one runway, and parking for six small planes. The runway seemed impossibly short and sloped downhill, ending at a steep drop off to the valley below. No wonder the Lukla Airport is known as the most dangerous airport in the world. To take off, the plane revved its engines while braking then burst forward down the short runway. There was definitely some nervous laughter among the 12 passengers (tourists and locals) as our tiny plane revved up. After take off, we relaxed and enjoyed the view of the Himalayas during the short flight to Kathmandu. After roughly 90 mi (145 km) of trekking, I was happy to be back in Kathmandu. It felt great to be warm and clean, and to relax, drink beer, and eat delicious food (that did NOT include dal bhat, curry, or fried noodles, rice, or potatoes!). I happened to arrive on Christmas Eve and fortunately two of my fellow hostel mates, Anaj and Felix (German), had organized a potluck. 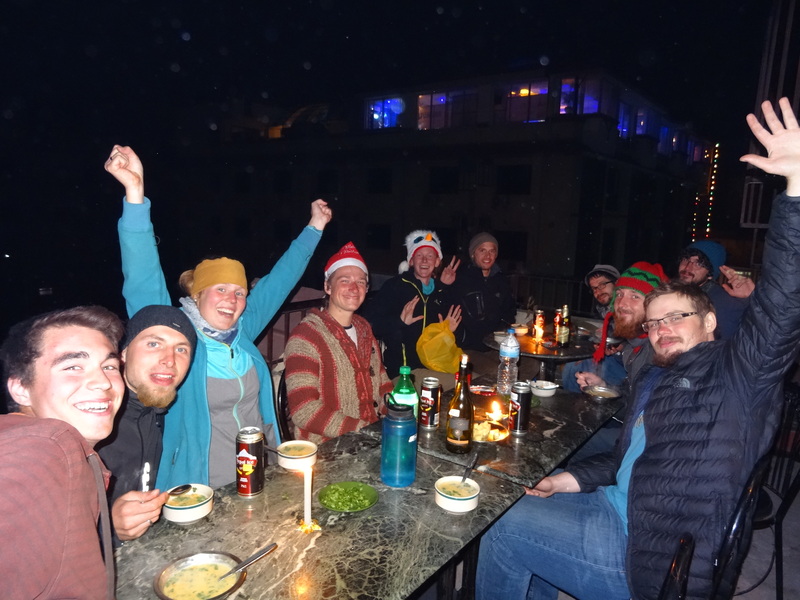 So I shared a delicious Christmas Eve dinner with about a dozen other travelers, including Thomas and Filip, on the rooftop of our hostel. We even played the white elephant game, which was interesting since the gifts consisted of items from everyone’s backpack that were no longer wanted or needed. The next day, Thomas, Filip, and I met Nathan, Raj, Ben, and a few other friends, at a restaurant to share a delicious Christmas lunch. It was a very memorable and merry Christmas with good food and great friends. Trekking in the Himalayas had been on my life list. It was amazing to be among some of the world’s highest peaks and to get a glimpse into the beautiful culture of the Nepali people. 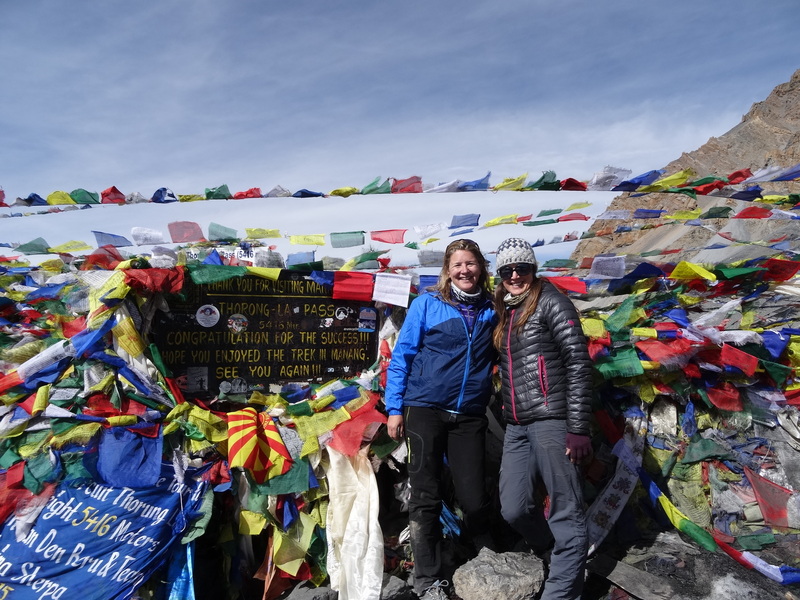 Also amazing is the fact that while the Annapurna Circuit, Annapurna Base Camp, Everest Base Camp, and Two-Passes trails are typically trekker super highways, I encountered relatively few other trekkers. Per the trekking permit office, over 20,500 people hiked the Circuit in 2014. However, in 2015, the number of trekkers on this trail was reduced by almost 50 percent. This reduction was likely due to the suspension of permits to climb Everest because of safety concerns related to the earthquake, the uncertainty about the conditions in Kathmandu and on other trails (i.e., the Circuit) resulting from the earthquake, and uncertainty associated with ongoing fuel shortages due to political conflicts between Nepal and India. While I hope, for the sake of Nepal’s struggling economy, visitation returns to normal or higher levels quickly, I have to admit I feel blessed that I was able to do these treks when I did. The fact that I was able to enjoy long stretches of the trail and stunning views, including the ones from Thorong La and Renjo La, by myself or with just a few friends is amazing and likely a once-in-a-lifetime opportunity. My experience in Nepal was amazing and was made even more memorable by the people, locals and fellow trekkers, with whom I shared it. Thank you all for being part of my experience. 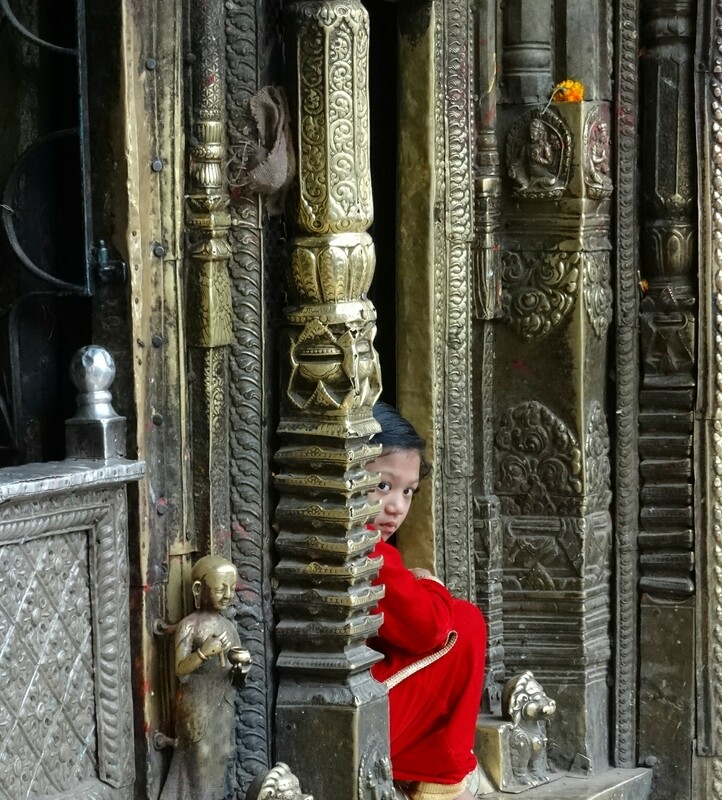 Nepali girl at one of the many temples in Kathmandu. With Corey at the top of Thorong La (17,769 ft, 5416 m). At Annapurna Base Camp (13,550 ft, 4130m). With Guillaume, Paul, and Alex on Everest Base Camp-Two Passes Trek. View of Everest and other high peaks from Renjo La (17,585 ft, 5360 m).